Government of Pakistan, National Industrial Relations Commission (Ministry of Overseas Pakistanis & HRD) has Advertised 04 New Jobs in Daily Express Newspaper Dated 29-03-2018. 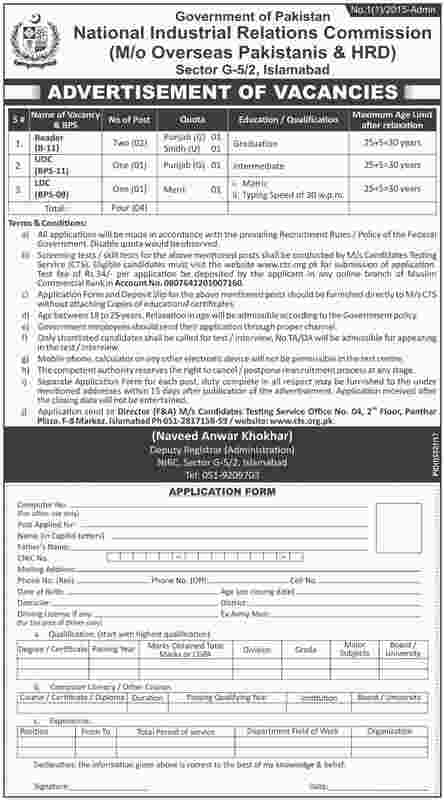 Candidates fulfilling the Required Criteria may apply for New Government Jobs 2018 for Reader (BPS-11) 02 Posts, Upper Division Clerk (BPS-11) 01Post and Lower Division Clerk (BPS-09) 01 Post. Recruitment Process will Be Made To Central Testing Service, Candidates Are Informed to visit website for more detail and description. All application will be made in accordance with the prevailing recruitment rules / Policy of the federal Government.